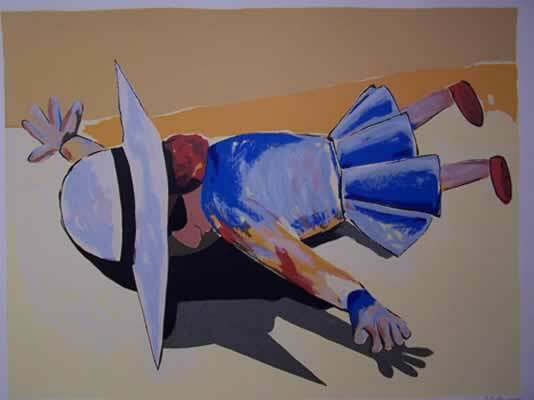 This art work is a Charles Blackman Limited edition Silkscreen titled Fallen School Girl, the edition was 75, the Sheet size is 750x1050mm. A folio of 5 works was made by Charles Blackman they where titled – Fallen Schoolgirl, Shadow, There Was, Hiding School Girl, and Jumping School Girl. Floating School Girl was a separate image from his 70th Anniversary series. The collection has been sold out for some time; Etching House from time to time buys back works form private collectors and offers them for resale.